The Chandra Source Catalog (CSC) is ultimately intended to be the definitive catalog of X-ray sources detected by the Chandra X-ray Observatory. To achieve that goal, the catalog will be released to the user community in a series of increments with increasing capability. 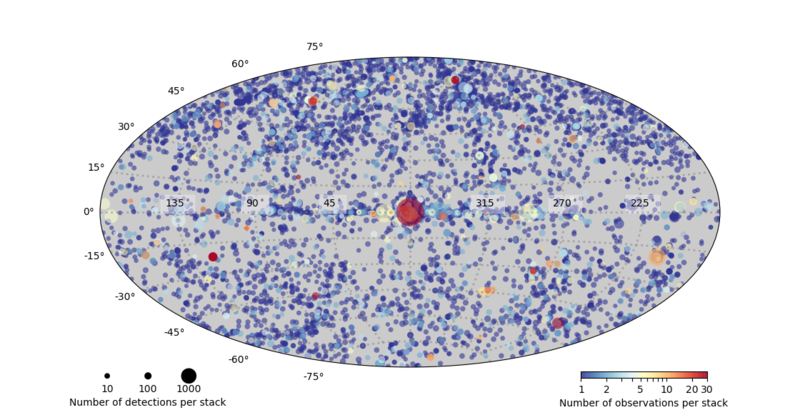 The second major release of the CSC (release 2.0) includes data for roughly 315,000 X-ray sources on the sky extracted from 10,382 Chandra ACIS and HRC-I imaging observations released publicly through the end of 2014. The locations, in Galactic coordinates, of the 374,349 detections in the CSC 2.0 pre1 release. The size of each symbol is proportional to the logarithm of the number of sources detected in the field, while the color encodes the number of closely-located observations. How do I access or download CSC 2.0? What properties are available in CSC 2.0? Is my favorite source in CSC 2.0? How do I find the flux of a source? What is the processing status of CSC 2.0? How do I cite CSC 2.0?